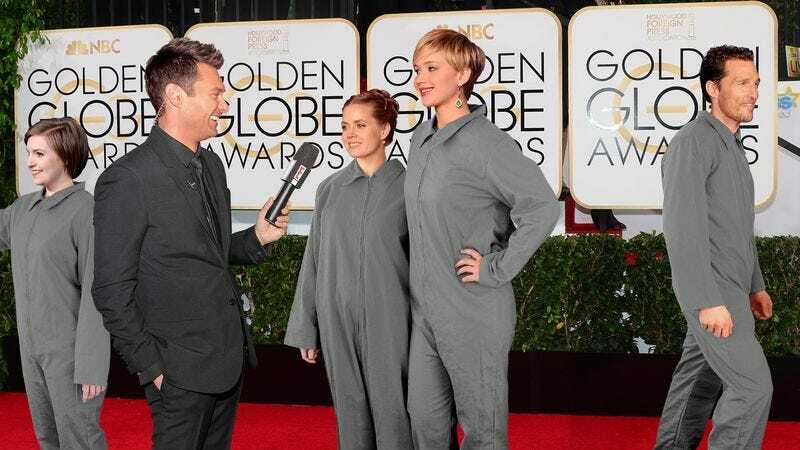 LOS ANGELES—Pundits from across the entertainment industry are hailing the fashion requirements put in place at last night’s Golden Globes as a resounding success, agreeing that the Hollywood Foreign Press’ mandate that all celebrities wear identical gray full-body unisex jumpsuits achieved the intended goal of refocusing the ceremony on the craft of acting and filmmaking. “The spirit of the Golden Globes has always been about celebrating individuals’ achievements in film and television, not their physical appearance or wardrobe, and the hundreds of required one-size-fits-all bodysuits worn last night certainly helped redirect attention to where it’s due,” said E! correspondent Kristina Guerrero of the compulsory gender-neutral garments that Hollywood A-listers were obligated to wear as they filed in a straight line down the red carpet, sans makeup, at precise intervals. “Of course, you can’t deny that despite the uniforms, the stars still dazzled. I mean, whether she’s wearing a custom Zac Posen gown or a woolen body covering and matte-finish Velcro sneakers, you just can’t take your eyes off Amy Adams.” Fashion critics pointed out, however, that typically couture-savvy Sandra Bullock did not wear the obligatory uniform well, noting that the star’s garish breast-pocket serial number distracted from her garment’s boxy, shapeless waist.